I’m a fan of changing recipes up to make them a little healthier. I love spinach in my smoothies, exchanging tons of vegetable oil for another fat and cutting out refined sugar for something else sweet. I’m sometimes a little wary of throwing vegetables in baked goods though in fear that there will be little strands of veggies and or taste less like a treat and more like a salad. I’ve made zucchini bread which doesn’t taste like zucchini and I’ve heard of sweet potato bread but never actually tried it.I had a container of boiled sweet potato that needed to be eaten so I figured I would try to throw it in something delicious. These cupcakes are chocolate-y, moist and not incredibly sweet but sweet enough. They’re also low in calories, carbohydrates and fat which makes it a lot easier to eat more than one. In a large bowl, combine all dry ingredients and mix. Add in egg whites, yogurt, sweet potato, milk and mix well until no lumps remain and batter has a cupcake batter consistency. Line a cupcake pan with cupcake liners and fill each liner half way with batter. The batter should make 12 cupcakes. Bake for 8 minutes or until the top has set and a toothpick comes out clean. Remove cupcakes from pan and place on a rack. 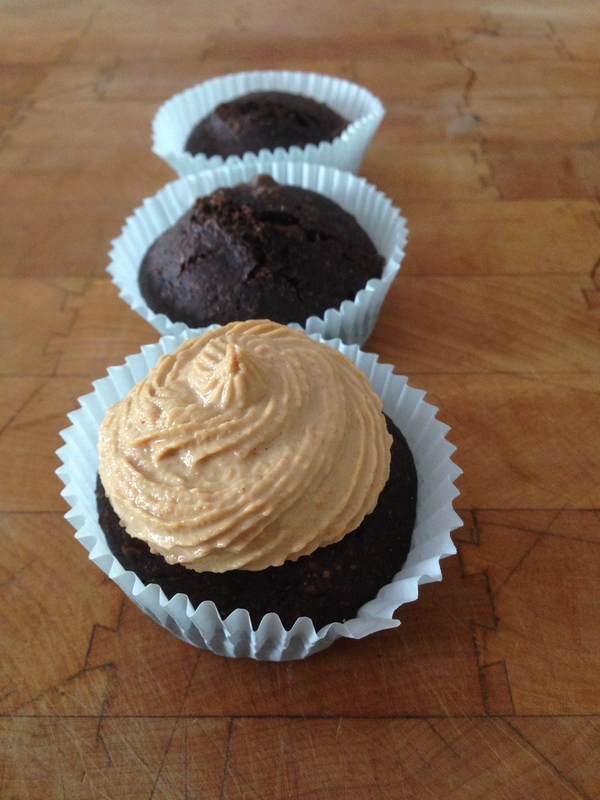 For the frosting, mix 1/4 cup peanut flour with a drop of vanilla extract and half a packet of monk fruit in the raw. Add water a tablespoon at a time until it develops a peanut butter consistency. Frost cupcakes. I eat a lot of the same foods. I consume different variations of the same thing for breakfast, lunch is usually protein and veggies and dinner is usually something similar. Until recently, I never found the need to meal prep, but lately, I’ve figured out how handy having things ready to eat truly is. Besides having food already in the fridge, I also make sure to keep a fully stocked cabinet of foods for snacks, condiments and additions to every meal. Even though it’s a little more expensive, I always buy the pre-cut butternut squash at the store. Peeling a butternut squash is more hassle than it’s worth and makes my meal prep a lot more difficult. I simply buy a package of squash, throw it on a baking sheet and roast it in the oven for about 40 minutes or until it’s soft. Sometimes I sprinkle half with cinnamon for something different. Having plain roasted squash is perfect for adding to salads, lunches, dinners or even mashing for something like pancakes. As for sweet potatoes, I buy a few and cut each one into differently so I can identify one potato. Usually I’ll do fries, wedges, rounds and chunks. I usually peel the chunks but not anything else. Like the squash, I simply throw them on a baking sheet and cook until soft. I LOVE cold sweet potatoes but they are also easy to just warm up. I usually buy a package of 99% (or 97%) lean ground turkey and put the whole thing in a pan right when I get home. I add a little water, a ton of chili powder, cayenne and paprika and cook it through like taco meat. Having ground meat in the fridge is an easy way to throw protein into stir-frys, wraps, omelette’s or anything else. I might be weird, but I love mustard on everything. In my opinion, it’s the perfect condiment. I put mustard on my salad as a dressing, put it on meat and dip my sweet potato fries in it. I use it like this because I simply love mustard but a plus is that it’s essentially a “free” food–only about 5 calories per serving. I have so many jars of peanut butter that it’s a little ridiculous although I personally believe you can never have too much. Peanut butter is an easy way to add satiating fat to any meal. 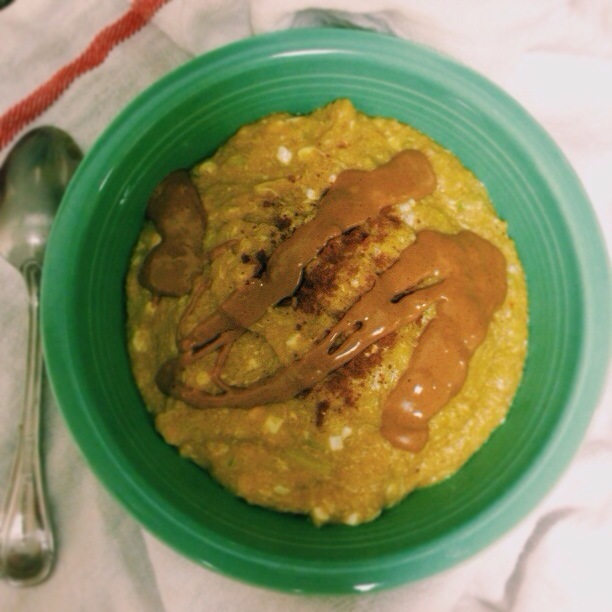 Peanut butter goes great on oatmeal and tastes delicious drizzled over squash or sweet potatoes. Not only that it’s easy to find little squeeze packets of PB to keep in your bag in case you’re starving with nothing around. I eat rice cakes as my pre-workout snack almost everyday. They also go hand in hand with the peanut butter. When you need a quick breakfast before a workout, a couple rice cakes with peanut butter and a banana works great. They are perfect as a snack and as a post workout meal, I’ll occasionally break one up with almond milk and eat it like cereal. Although I usually buy plain ones, I love the apple caramel ones for something sweet and cheddar for something more savory. Of course I always have other things in my pantry but these are all constant and they make grabbing something to eat a lot easier when time is tight or when I don’t feel like making anything. A few years ago, I would have never considered myself an oatmeal person. I wasn’t a fan at.all. My mom always makes them with water which makes them a little sticker and a bit flatter than making them with milk. Now that I like oats, this is okay, but I definitely still love a creamy texture and I’m all about volume. I recently discovered oat bran as a breakfast alternative to oatmeal and I am smitten. Not only is it a perfect breakfast because of the slow digesting carbs and a ton of fiber, it’s pretty versatile like oatmeal and is definitely fluffy. If you haven’t noticed, I’m also a fan of throwing all my foods together in a bowl or on a plate. I don’t know why–I just love everything mixed. So, I’ve been making this breakfast every day for the last two weeks now. It incorporates the carbohydrate (oat bran) with the protein (eggs) and a vegetable (zucchini/pumpkin), a bit of fat (peanut butter) and some dairy (cottage cheese). All the layers of the food pyramid right there (essentially). Add water, sprinkle of cinnamon and a sprinkle of pumpkin pie spice to a small pot and boil over medium heat. Add oat bran and stir until no clumps remain. Add in zucchini and pumpkin and stir to incorporate. Stir every few seconds while the mixture cooks. When the whole thing begins to boil and there is no visible water, stir while pouring in the egg whites. Continue stirring while the egg tries to set and until there is no visible raw egg. Cook for another 2-3 minutes, stirring often. Remove from heat and stir in cottage cheese. Pour into a bowl and top with peanut butter and extra cinnamon if desired. 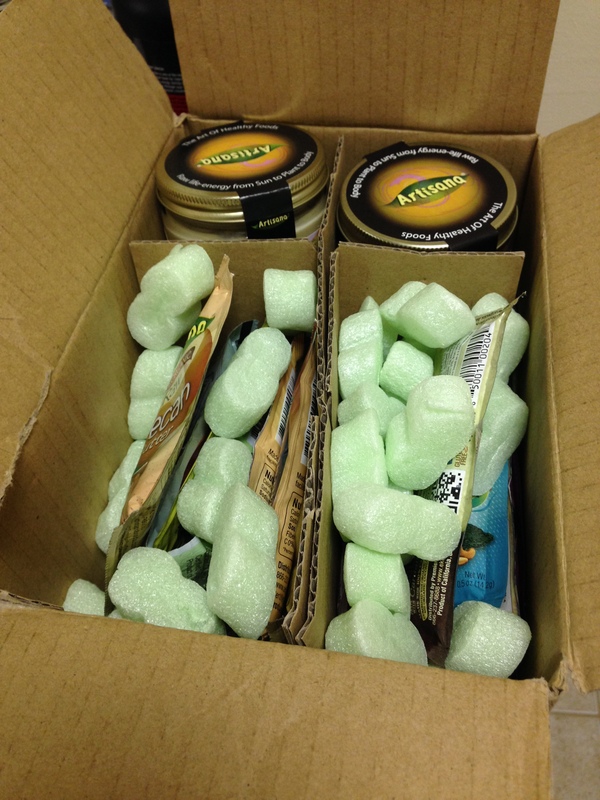 This package arrived at my door today that made me feel like I had died and gone to nut butter heaven. Seriously. 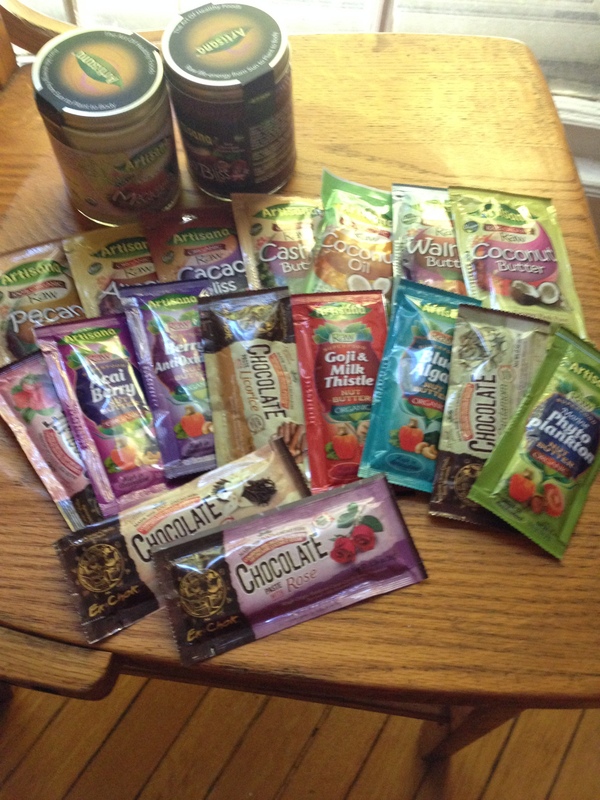 When Artisana told me they would send me a package to review, I had no idea that they would send me EVERYTHING. Inside this lovely box was a full size jar of both macadamia nut butter and cacao bliss coconut butter and a bunch of little squeeze packs for on-the-go snackage. 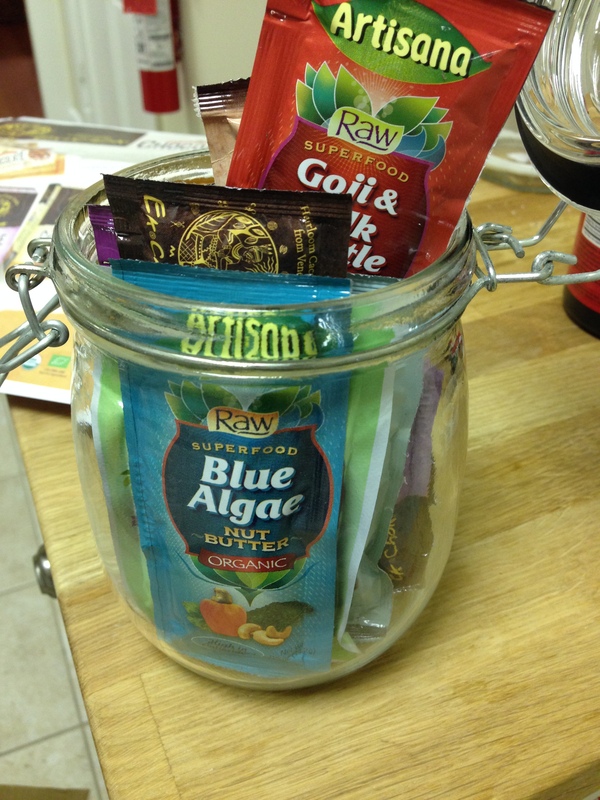 I obviously couldn’t wait to try everything so I ripped open a few packets and the jars and taste tested. The cacao bliss coconut butter is the smoothest and creamiest coconut butter I’ve ever had (and I’ve had a bunch). It’s rich and not too sweet. Perfect for eating off a spoon, or on an apple or on anything for that matter. The macadamia nut butter was also delicious. With the consistency of a crunchy peanut/almond butter, this butter almost melts in your mouth instead of giving you that “gummy” feeling a lot of peanut butters give you. The first packet I dove into was the blue algae. To be honest, I didn’t really like the taste or texture. I’m not sure if I didn’t squeeze the package enough as instructed but it was very liquid-y. I broke into the chocolate packets next including the cardamom and the licorice. Not a big fan of licorice in general so this one didn’t suit my fancy but was pretty good considering. The cardamom was certainly interesting. The flavor was well suited to the chocolate and it was definitely different than anything I had ever tried. My final packet of the afternoon was the pecan butter. Absolutely delicious. My favorite part about all these products is the packaging. They are each one serving which makes it the perfect item to bring along in the car, to class, for after the gym, etc. No mess, no melting and no eating spoonfuls out of the jar at a time (…don’t look at me…). My second favorite part (in a tie) is that none of them have to be refrigerated and the ingredients are simple. Cashew butter has cashews. Pecan butter has pecans. In case you were wondering, they are also gluten free! Overall, I think Artisana’s products are definitely top of the butter-line. Their coconut and nut butters are consistently smooth, creamy and flavorful. I will definitely purchase more when I run of these! Do you have a favorite Artisana product?